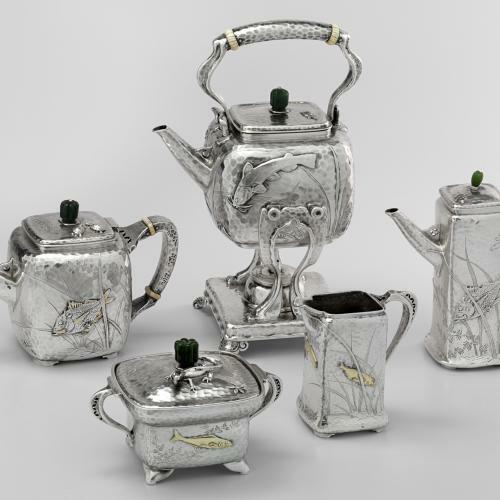 This tea set was made by the renowned firm of Tiffany and Co., which was established in 1837 by the American goldsmith and jeweller Charles Louis Tiffany. 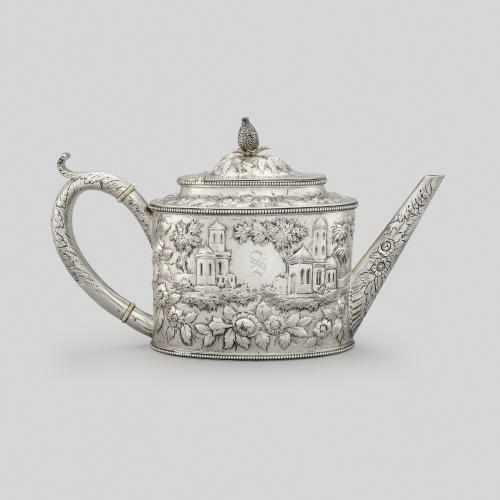 From the beginning, the firm drew inspiration from a wide range of European decorative styles to create refined silverwares for a wealthy and influential clientele. 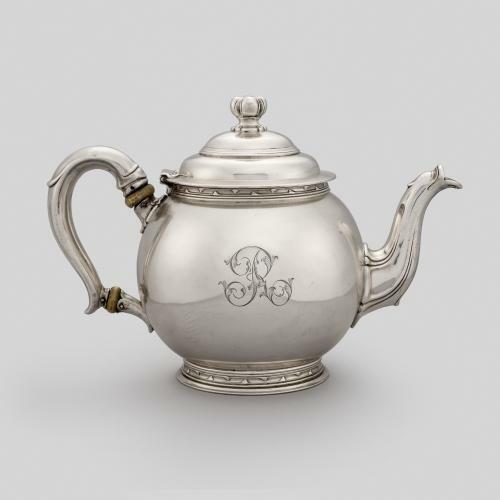 The firm’s later success, however, is almost entirely due to Edward C. Moore (1827- 1891), who became Tiffany’s chief designer around 1850 at the age of 24. Moore went beyond the revival of rococo and classical design that was fashionable at this time, and was greatly influenced by The Grammar of Ornament (1856) written by the leading English designer Owen Jones, which illustrated ornament and decoration from other cultures and periods. 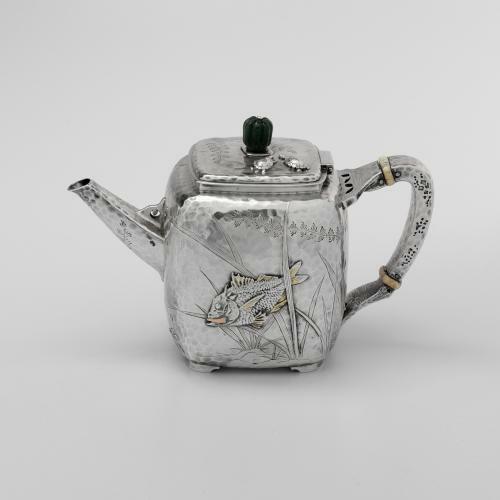 By the 1870s, after creating a successful range of ‘Moresque’ and ‘Persian’ wares, Moore looked to Japanese objects such as sake bottles and brush pots for inspiration and created a highly successful range of wares in the ‘Japanesque’ style. 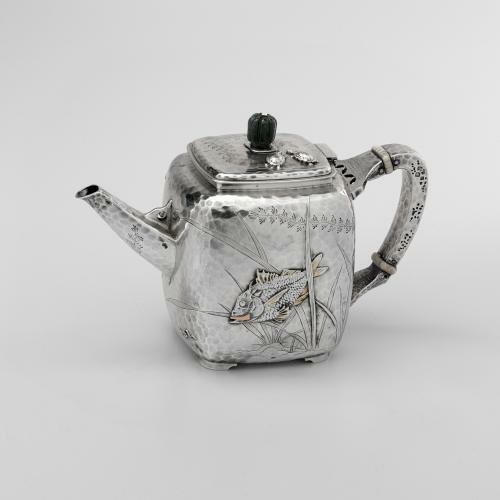 This tea set comprises a hot water kettle, teapot, milk jug, sugar bowl and hot water jug and is decorated with marine life in various metals such as gold, platinum, copper and metal alloy that is often characteristic of Japanese metalwork ornamentation. The uneven surfaces demonstrate Moore’s preference for martelé, a ‘hammering’ technique which he introduced in late 1876. 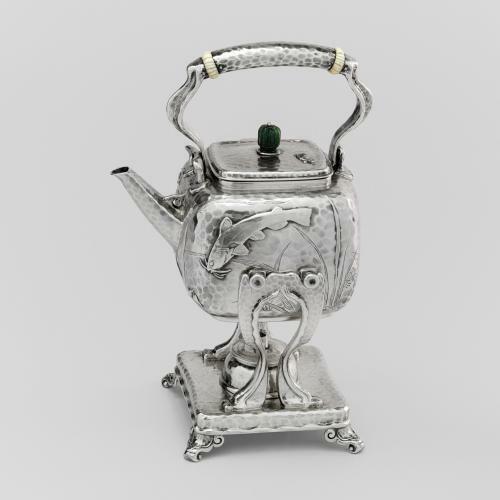 The unusual square form of each piece is inspired by the work of the English designer Christopher Dresser, who collaborated with Tiffany and Co. and whose designs were greatly admired by Moore.